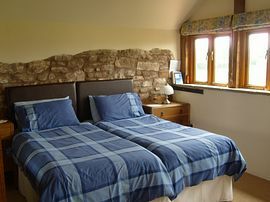 Little Gaerfields is set on a family farm with wonderful views across Herefordshire. 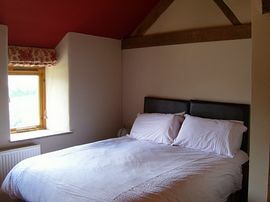 Once used to milk the cows in, the lovely old barn has been converted to a high standard to sleep up to 20 people. A very spacious accommodation with ample room for everyone to sit, eat and party together. There is underfloor heating, built in vacumn, stained glass window, inglenook fireplace, beamed walls, a mezzanine with a small balcony leading from it in the house. Large, comfortable 5' or 6' zip and link beds, bunkbeds and extra z beds make it an ideal venue for hen/stag parties or family reunions. Outside there is a play area for children, there is an indoor swimming pool with swim jet. You can enjoy fresh eggs for breakfast or go on a guided walk for wild food. If you want a break from the cooking why not have the local chef deliver in your meals or celerbration cakes, just check out our web site for the menues and prices. Herefordshire has so much to offer for holdays with plenty of activities, walks and history. We will be here to welcome you and give as much help and guidance as you need to plan your perfect holiday, in a truly warm home from home. A large dining room to seat up to 20. Ideal for hen/stag and family parties. Pets by arrangement with cottage owner at £5.00 per day. £200.00 to £4000.00 minimum 3 nights. 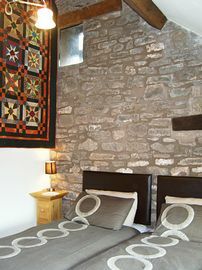 Weekends are very popular, telephone for special mid week prices for as little as 2 people staying.